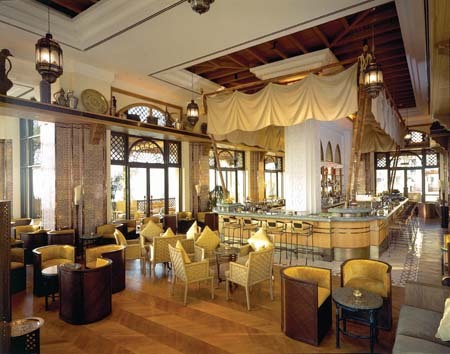 Elevated to emphasize its splendour, Al Qasr is the ‘palace’ at the heart of Madinat Jumeirah. Approached via a ceremonial causeway, this majestic mansion-style hotel rises up to form the jewel in the crown of the world’s most sublime resort and authentic re-creation of ‘old Arabia’. A place where the old Arabian charm meets new fashioned luxury, this Arabian oasis is designed to reflect the aura of a Sheikh’s summer residence. The beauty of the resort is enhanced by the pathway that leads into this Arabian resort, lined with trees and adorned with stone carved horses. To keep up with the stunning architecture on the exterior of the resort, all the rooms at Al Qasr have a traditional Arabic decor which induces a romantic feel. Furthermore, all the rooms are in immaculate condition and are provided with all kinds of modern amenities. Surrounded by water, Al Qasr forms a virtual island looking down upon a multitude of fascinating aspects: Ancient windtowers, pools, meandering waterways and the superb 2km wide private beach.